Every day Hingham residents drive or walk past the entrance to a small park lying between Central and Hersey Streets. Now known as Burns Memorial Park, it was once home to Tranquility Grove, an outdoor space used for meeting and rallies—including in particular abolitionist rallies. Hingham was home to an active group of abolitionists. Led in large part by local women who were considered extremists by many, Hingham’s abolitionists worked for freedom through petitions, speeches, meetings, and protests. High-profile abolitionists visited Hingham regularly during this period, including Frederick Douglass (who came more than once), William Lloyd Garrison, an aging John Quincy Adams, and the Grimke sisters. God made us free! Then fetter not a brother’s limbs! Welcome All to Freedom’s Altar! The grove long named TRANQUILITY. Pure love and TRUE HUMILITY. The efforts of the Hingham abolitionists contributed to the larger national abolition movement which would continue to gain traction across the country until the Emancipation Proclamation brought their hard work to fruition. The banners remain an evocative reminder of Hingham’s participation in that important work, and their powerful statements still right true to this day. Sometimes, even the most mundane documents give us deeper insight into the lives and relationships of Hingham’s oldest families. Such is the case with a collection of deeds and wills recently donated to the Historical Society by Philip S. Allen. 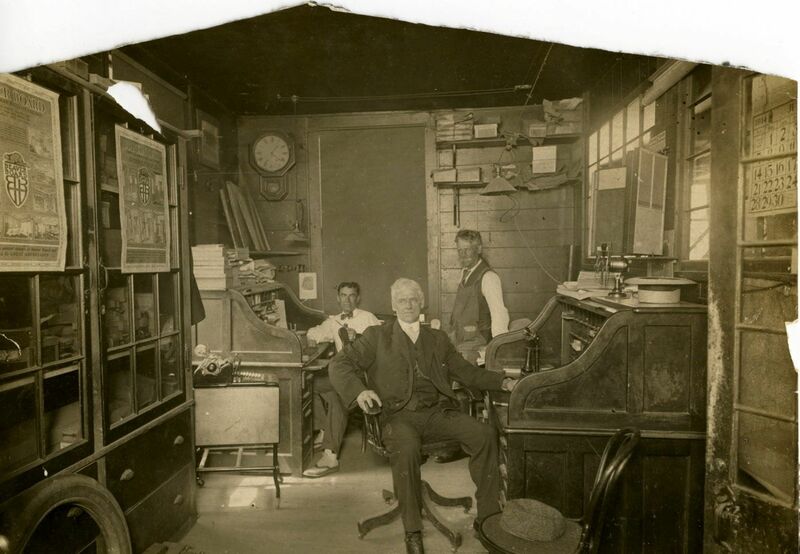 The focus of the collection is the Lane family, one of Hingham’s oldest and most prominent, particularly well-known for Jared Lane, one of the town’s many talented coopers. The deeds and wills, however, cast light on Hannah Lane, the widow of Rufus Lane, Jared Lane’s brother and a painter who resided on South Street where the Hingham Water Company once stood. The first deed from Hannah is dated 1811, ten years after Rufus’ death, and conveys to Charles and Rufus a small shop and its contents located on Town land near Elisha Cushing’s estate (now, 692 Main Street). Like later conveyances to Charles and Rufus, the shop was conveyed to them jointly. Charles and Rufus are described as “painters,” like their late father, and paid their mother $300 for this property. Hannah later conveyed other real estate, with a house upon it, to Charles and Rufus jointly. 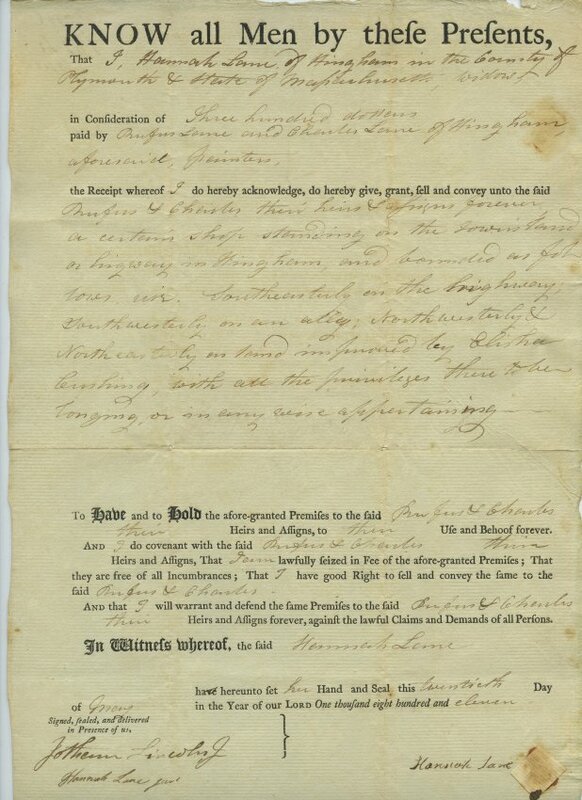 In April 1824, they divided this property between them, by means of a Land Division Agreement, also in our collection. It is easy to tell the two are brothers just by the language used in the agreement. Like two young boys dividing a candy bar, they drew a very specific line down the center of the property—and through the house—with each brother getting half. The Agreement addresses the specific aspects of the house and property to which each is entitled—including entire rooms which are divided and split down the middle. The brothers acquired other land over the years, and not always from their mother. Another deed in our collection, from January 1824, evidences their purchase of nearly three acres of woodland in the area of Hingham known as the “Third Division” (the area of Levitt Street, merging into present-day Wompatuck State Park) from the previously mentioned cooper Jared Lane and his wife Sarah for $133.33. The brothers jointly owned the firm of R & C Lane, which was engaged in mackerel fishing and dealt in fishermen’s supplies, and they frequently sold property back and forth between them. One deed in the collection has Rufus buying land and “all the buildings upon it” on North Street from his brother Charles for the considerable sum—in 1833—of $2,700. As the years went by, their property holdings began to reflect their unique personal interests, but that didn’t stop their mother from continuing to sell to the two of them together. The final deed in this collection, dated March 1835, is from Hannah to her two sons—again jointly—conveying a shop and land at the junction of North and South Streets in Hingham Square, for $717.87. The collection includes Hannah’s Last Will and Testament, written in 1835. Upon her death, in 1838, she bequeathed all of her remaining real estate not just to Charles and Rufus but also to her one surviving daughter, Sally, who had married Benjamin Parker of Boston in October 1814. (This was the sole mention of Sally in these Lane family documents.) She left her personal property to her eight grandchildren. The will of one of these grandchildren, Abigail, is the final record in this collection. Abigail’s will, made only three days after her grandmother died, leavers all of her personal and real estate to her cousins, Charles Lane, Jr. and Rufus Lane, Jr.